"These arrests and detentions have once again underlined the totalitarian nature of this regime, which is a habitual offender as far as criminalisation of dissent is concerned." New Delhi: Several political parties and civil society organisations condemned the arrests of activists and raids on their homes by the Pune police on Tuesday. Many believed that the actions were reminiscent of the Emergency. They also felt the government was trying to divert public attention from their failures by targeting democratic activists, who have raised their voices against abuse of state power, in an organised way. Excerpts from various press statements follow. The Polit Bureau of the CPI (M) strongly protests the raids conducted by police authorities on the homes of various civil rights and human rights activists and Left intellectuals. Ever since the Bhima Koregaon violence against Dalits, the Maharashtra Police along with central agencies have been targeting Dalit rights activists and lawyers who have been taking up their cases. False charges have been levelled and the draconian Unlawful Activities Prevention Act invoked. These constitute a brazen attack on democratic rights and civil liberties. The Polit Bureau demands the withdrawal of the cases against these activists and their immediate release. In a move reminiscent of the infamous Emergency, human rights activists have been arrested, and the homes of activists, writers and other dissenting voices all over the country raided. The arrests and raids are reportedly at the behest of the Pune police in the Bhima Koregaon matter, in which Dalit and feminist activists and advocates have already been arrested. The attempt to project the peaceful Bhima Koregaon event as an act of terrorism is utterly baseless and condemnable. It is shocking but not surprising that under the BJP rule at the Centre and in Maharashtra, rights activists are arrested and booked on terror charges under draconian laws – while terror outfits like Sanatan Sanstha and Shiv Pratishthan unleash violence on Dalits, plot terrorist attacks, assassinate dissenters and yet are referred to by BJP leaders including the current Prime Minister of India as ‘nationalist’. The arrests and raids are an attempt to brand all dissenting voices as ‘anti national’ and intimidate them as the parliamentary polls draw nearer. Under the Modi regime’s undeclared Emergency, rights activists and dissenters are either shot at, killed, or raided, arrested and jailed. These arrests and detentions have once again underlined the totalitarian nature of this regime, which is a habitual offender as far as criminalisation of dissent is concerned. Under the cover of Bhima Koregaon investigation, human rights activists are now being targeted. First, you attempted to brutalise Dalits and now you are going after activists. Are we heading towards the death of democracy? The arrests and sudden raids are highly objectionable and condemnable. It shows that the BJP is hassled, nervous. When elections near, they have nothing to tell the people about their achievements. So they want to create an atmosphere of fear among the minds of people who question the government. The BJP is scared because even ordinary people are questioning and accusing the BJP-led Central government of not fulfilling any of its promises. They are targeting intellectuals because the BJP thinks these are the people who are behind ordinary people raising questions against the government. By conducting such arrests and raids, they want to silence the ordinary people. We condemn the arrest of prominent human rights activist Sudha Bharadwaj and others in strongest possible words. We demand that the BJP governments should stop these conspiratorial and oppressive actions against all those like Bharadwaj who have been fighting against the state repression of the rights of Adivasis and Dalits. Bharadwaj is a senior human rights activist, trade unionist, and an advocate in the Chhattisgarh high court. 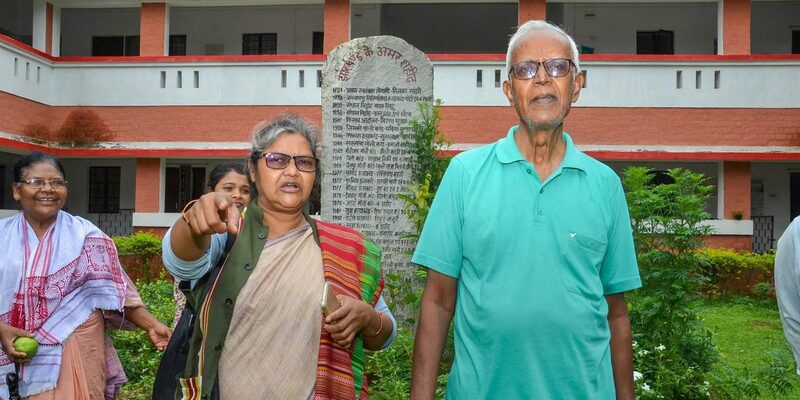 She has been associated with Shankar Guha Niyogi’s workers’ association for the last 30 years and has been tirelessly fighting for the rights of workers. She has also been fearlessly defending those vulnerable people who have been falsely accused by the police in different cases. If this is her crime, then all those who have been raising their voices against authoritarianism, fascism, and globalisation in critical and creative ways are equally guilty. Today, there is an environment of fear and terror across the country. Dalits, Adivasis, farmers, workers, minorities are all being attacked constantly. And those fascistic forces who are behind these attacks are being protected by the state machinery. Be it in Bhima Koregaon, or elsewhere, BJP governments are ensuring that constitutional and democratic rights of people are crushed to facilitate corporate loot smoothly. Anyone who is critical, be it social workers, intellectuals, lawyers, journalists, students, or youth, are being imprisoned in false cases. The arrests of prominent activists and intellectuals Sudha Bharadwaj, Vernon Gonsalves, Gautam Navlakha, Varavara Rao, Arun Ferreira and others, are nothing but an attempt by the government to strike terror among those who are fighting for justice for the marginalised. This is also an attempt by the BJP to invent a false enemy and engage in scaremongering in order to polarise the 2019 elections in its favour. Already, the government and the media houses close to the BJP have been trying to spin a false narrative of a Maoist conspiracy since June, 2018. Terms like “urban naxals” are invented in order to stifle any criticism of the government. We have learnt that the Delhi Police, after having arrested Sudha Bharadwaj, waited for Republic TV to arrive before taking her to the court. This simply shows that the arrests are incomplete without the accompanying sensationalist media propaganda to demonise activists, human rights defenders and intellectuals. PUCL asserts that the arrests and raids are nothing but a targeted crackdown and attack by the police and state on civil liberties and democratic rights activists across the country in a concerted attempt to crush human rights interventions and silence voices of dissent. PUCL stands firmly in solidarity with advocate Sudha Bharadwaj, National Secretary, PUCL and the other human rights activists who faced raids and have been arrested under false and fabricated charges. The current arrest and raids are taking place in the backdrop of the arrests of five human rights activists – Advocate Surendra Gadling, Professor Shoma Sen, Rona Wilson, Mahesh Raut and Sudhir Dhawale – who were also arrested under UAPA on 6th June 2018, relying on a similar fabricated letter produced by Republic TV allegedly addressed to the same “Comrade Prakash”, in the same Pune case. Following this, on 7th June 2018, Advocate Sudha Bharadwaj had addressed a press conference organised by the Indian Association of People’s Lawyers (IAPL) in New Delhi to condemn the arrest of Advocate Surendra Gadling of the Nagpur High Court. Susan Abraham, Arun Ferreira and Vernon Gonsalves are in fact representing the Bhima Koregaon accused in Court. PUCL believes that the intention of the state and police in targeting the aforesaid human rights activists by foisting false and fabricated cases against them, is clear and apparent from their profiles of work. All the aforesaid human rights activists targeted in this multi-city “operation” by the police have been tirelessly involved in advocating the cause and fighting for the rights of the most poor, marginalised sections of society against serious state violations and unscrupulous corporates. They have stood for the principles of human rights enshrined in the Indian Constitution and the international standards on human rights. This simultaneous crackdown against human rights activists across the country signals the imposition of an unofficial Emergency in our nation and is a direct attack on Indian democracy. This is a deliberate strategy of the state to target noted human rights activists in a clear act of reprisals against them for calling out the human rights violations by the state and police, and to intimidate those who are fighting for justice. Today’s arrests is the second of such crackdowns on rights activists, advocates and journalists who have been critical of the state. All these people have history of working to protect the rights of some of India’s most poor and marginalised people. Their arrests raise disturbing questions about whether they are being targeted for their activism. These arrests cannot become the order of the day. The government should protect people’s rights to freedom of expression, association, and peaceful assembly instead of creating an atmosphere of fear.